With WebMerge, you can upload, merge, and deliver smart documents in a snap. Start from scratch or upload your own fillable PDF or Word document. Our app allows you to easily customize your document and merge it with data. Creating your document is as easy as creating a document in your favorite word processor. Read more about building your own document. A fillable PDF allows users to type data directly into the PDF, then print - and we then save the data! Read more about Fillable PDFs. With WebMerge, you can modify the document after a merge happens and continue to edit the style and branding. Read more about merging documents. You create it. We deliver it. Once you've created your document, now it's time to figure out where you'll be sending it. From emails to Google Drive to a third-party integration via Webhooks, WebMerge gives you the control to send your merged files wherever you want. You have your document completed and now you need to marry it with the data you have. 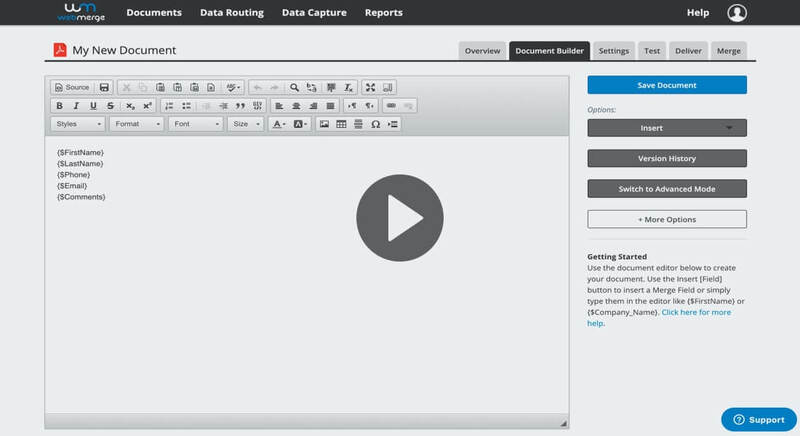 WebMerge allows you to choose how you want to bring your document and data together. Check out the options below. Using our API, 3rd party services can grab a list of documents in your account, the fields that are in each document, and then send data to each document via Webhook using a unique URL. If you already have data in a spreadsheet, simply save that spreadsheet as a CSV and you can upload the data directly to WebMerge. We'll merge each row as a separate document. Mainly used for internal document creation, we offer a basic web form that can be used to quickly generate a merged document and automatically send via one of our delivery options at any time.